Where else but Israel would you find a sitting prime minister going down to the beach on election day to tell bathers to get dressed and vote? Bibi Netanyahu’s blitz on Netanya yesterday tells you all you need to know about the man. He does not accept no for an answer and will always seize the very last chance and opportunity to stop or reverse something he feels is a clear and present danger to the people and state of Israel. It's that true grit that took him to the US Congress to defy Obama’s sellout to Iran. It’s what took him to Moscow so many times, even after the disastrous downing of that Russian airplane for which all of Putin’s military brass openly blamed Israel. That’s what took him to previously hostile countries to try and build alliances that seemed impossible just 5 years ago. 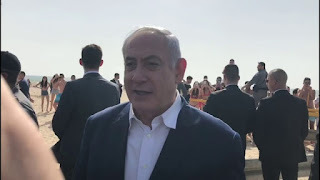 And that’s what took him down to Netanya beach on election day. After four terms as prime minister of the world’s most talked-about country, Netanyahu could easily retire with enough book deals and lecture fees to pay for a small submarine. But he feels passionately that with Trump in the White House for another two or six years, he is uniquely placed to take advantage of the most special relationship that’s ever existed between the Oval Office and Jerusalem. In just over two years of Trump’s tenure we have seen the US embassy opened in Jerusalem, recognition of our sovereignty over the Golan Heights, massive sanctions on Iran and cuts in funding to UN and Arab entities engaged in discrimination against Israel and the propagation of incitement and boycotts. There is still plenty of work to do. Let’s hope the final results put a better shine on the Right. And let’s hope than Bennett & Shaked pass the threshold with the help of IDF votes.